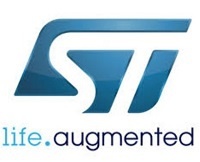 STMicroelectronics is one of the world’s largest semiconductor companies. Offering one of the industry’s broadest product portfolios, ST serves customers across the spectrum of electronics applications with innovative semiconductor solutions by leveraging its vast array of technologies, design expertise and combination of intellectual property portfolio, strategic partnerships and manufacturing strength. The Company has particular strengths in Multimedia, Power, Connectivity and Sensing technologies and its sales are well balanced among the industry’s major sectors. Since its creation, ST has maintained an unwavering commitment to R&D and is one of the industry’s most innovative companies. In 2011 the Company spent about 24% of its revenue in R&D. Among the industry’s most innovative companies, ST owns over 21,500 patents and pending patent applications. ST’s process technology portfolio includes advanced CMOS logic including embedded memory variants, mixed-signal, analog and power processes. ST has a worldwide network of front-end (wafer fabrication) and back-end (assembly and test and packaging) plants. ST has established a worldwide network of strategic alliances, including product development with key customers, technology development with customers and other semiconductor manufacturers, and equipment- and CAD-development alliances with major suppliers. These industrial partnerships are complemented by a wide range of research programs conducted with leading universities and research institutes around the world, in addition to playing a key role in Europe’s advanced technology research programs such as CATRENE (Cluster for Application and Technology Research in Europe on NanoElectronics), a successor to MEDEA+, and industry initiatives such as ENIAC (European Nanoelectronics Initiative) and ARTEMIS (Embedded Computing Systems Initiative). MOEMS designs, Technology Demonstrator’s leader, Pilot Line’s process and technology front-end development. ST-I is Project Coordinator, WP2 and WP7 leader.